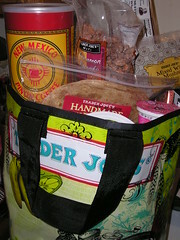 What you see here is the tip of the iceberg, after my inaugural visit to Trader Joe’s Princeton. I missed the early day mahem but checked Twitter and it seemed a huge crowd was there. By the time I arrived around 3:30pm, you could actually snag a cart and move around a little in the store. Whole wheat English muffins – check. Candied almonds- check. New Mexico Piñon coffee (roasted with pine nuts) – check. And on and on, right down to green tea mints, pomegranate yogurt, gourmet dried mushrooms, handmade whole wheat tortillas and fully cooked, vacuum-packed teeny black Beluga lentils. I’d forgotten how extensive TJ’s selection of frozen foods is, they are the king of gourmet convenience foods, which, while we shouldn’t live on that kind of thing, does come in handy for surprise company and rushed meals. There are a lot of single serve ethnic foods, too, like Indian and Mexican, and a lot of it is vegetarian. You can even buy frozen cooked rice, brown and jasmine, several pouches in each box. And what you don’t see, because I rushed it right into my freezer, is the Mango Passion Torta Cotta, one of TJ’s many frozen desserts, with layers of crunchy nougat, biscuit and fruit. Fortunately, it’s pre-cut into many servings. I would have never thought of buying that if I hadn’t seen a woman with a bunch of them in her cart. Who am I to pass up such a broad hint? Ah, yes, Trader Joes – I finally visited them today after reading Faith Bahadurian’s colorful review and headed straight for the Whole Wheat English Muffins – a delicious, crunchy bread at the bargain price of $1.49 – or maybe $1.59 per half dozen, but that costs out to about 26 cents a muff. I wished I had more time to explore the place, but I’ll be back for sure. Sounds like Faith had a splendid time! I’m heading over; I’ve never been to a Trader Joe’s. Seems impossible.